With hops flowers, oats and African black bean as well as GABA and melatonin for rest and sleep. Dietary supplement with hops flowers, oats and African black bean as well as GABA and melatonin. The consumption of oat cabbage with exaggerated anxiety and nervousness has a long tradition in folk medicine. The soothing and relaxing effects of the oat herb are attributed to the natural ingredient gramin. Vitamin B6 and GABA also support psyche and nerves. In addition to flavonoids, chalkonen and tanning agents, hops flowers also contain Humulon and Lupulon. 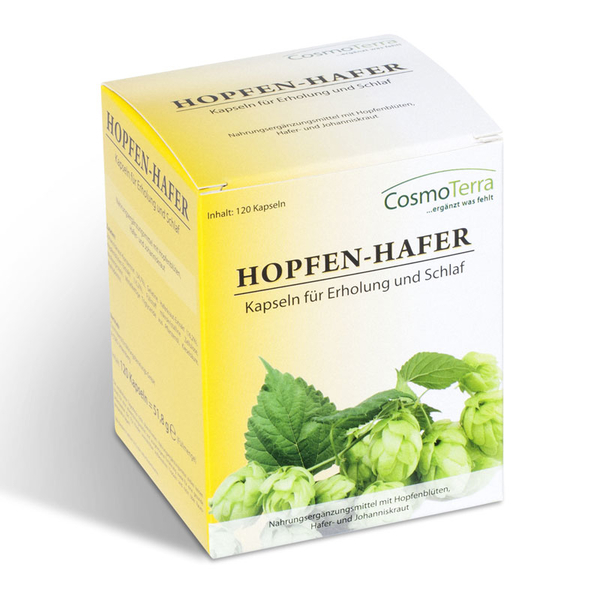 These two ingredients are responsible for the soothing, sleep-promoting effect of hops. Pantothenic acid contributes to the normal formation of some nerve messenger substances. The amino acid 5-HTP is Seratonin from the African black bean with the help of pantothenic acid and biologically active Vitamin B6 and this, with the help of N-Acetyl-methionine, converted to melatonin. Melatonin is especially formed during the night hours and supports a restful sleep. Consume 2x 1 capsule daily with sufficient liquid. 6mg vitamin B5 (pantothenic acid, *100%), 2.8mg vitamin B6 (pyridoxol, *200%), 210mg hops flowers extract equals 1575mg hops, 210mg oats herbal extract equals 2100mg oats herb, 51mg griffonia seeds (African black bean) contains 50mg 5-hydroxy tryptophan (5-htp), 100mg gamma aminobutyric acid (GABA), 50mg n-acetyl-l-methionine, 1mg melatonin. * RDA (recommended daily Allowance) = Recommended daily feed rate. The values of the ingredients are based on average analyses. Oats extract, hops flowers extract, capsule shell hydroxypropyl methylcellulose, gamma aminobutyric acid, griffonia seeds extract, N-Acetyl-L-methionine, whey protein concentrate, filler microcrystalline cellulose, release agent magnesium salts of edible fatty acids, calcium-D-pantothenate, pyridoxal-5-phosphate, melatonin.